Repower Balcombe is a community energy group founded as a positive response to threats of fracking in the area. The group have funded solar PV on 4 schools in the area, including this one at Turners Hill Primary which was installed by Joju in 2015. With their community benefit fund from existing sites bearing fruit, they decided to set up a battery storage project to understand this new technology better. The challenge for Joju Solar was to design and specify a battery storage system that maximises the benefits to the host school. The school is typical of a small commercial battery storage system, which has very different characterisitcs to domestic battery systems. The electricity supply to the school is 3-phase, so we needed to install storage across all three phases. With 3-phase batteries of this scale not available in the UK as present, we installed 3 separate battery systems, each dealing with the load and generation on that phase. 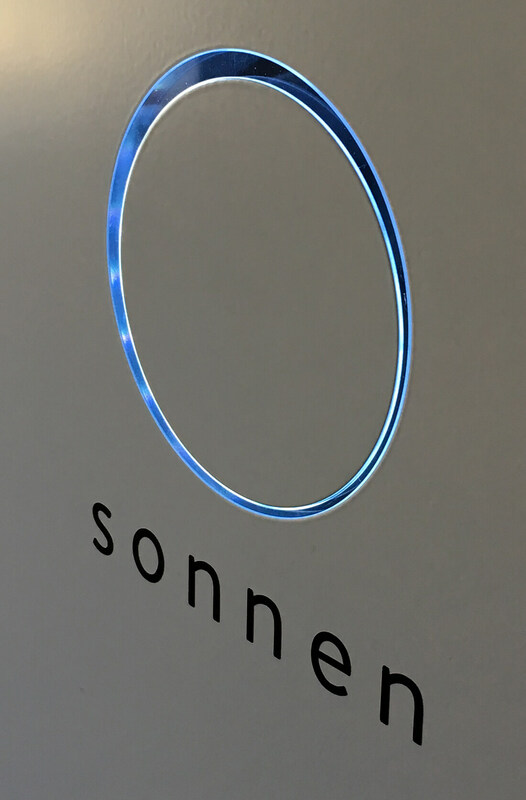 You can see the three individual storage units, manufactured by Sonnen, in the photos. Technically the greatest challenge related to the battery’s monitoring – it needs to monitor the extent of import and export from the school and the generation from the solar PV. The PV system was some 20 meters from the battery installation so we needed to run long monitoring cables as part of the works. The system operates under a regime where excess solar generation is captured during the day, and used to run the school in the evenings and through the night. We gathered half-hourly electricity demand data from the school, and undertook a comprehensive modelling exercise to determine the optimal battery size. In order to meet the evening and night-time demand, we settled on a storage capacity of 4kWh per phase. The graph (left) shows that we have sized the system almost perfectly. The purple line shows the energy stored in the battery. The solar charges it up to full capacity in the morning, where it remains until early evening. Once demand is no longer met by solar, the battery discharges to meet demand on site. It’s empty again just a matter of minutes before the sun comes up and starts charging it again! Electricity imported from the grid, shown in pale blue is virtually non-existent; the school is running on its own solar generated electricity. The installation took place at Turners Hill School in Turners Hill village in Sussex. 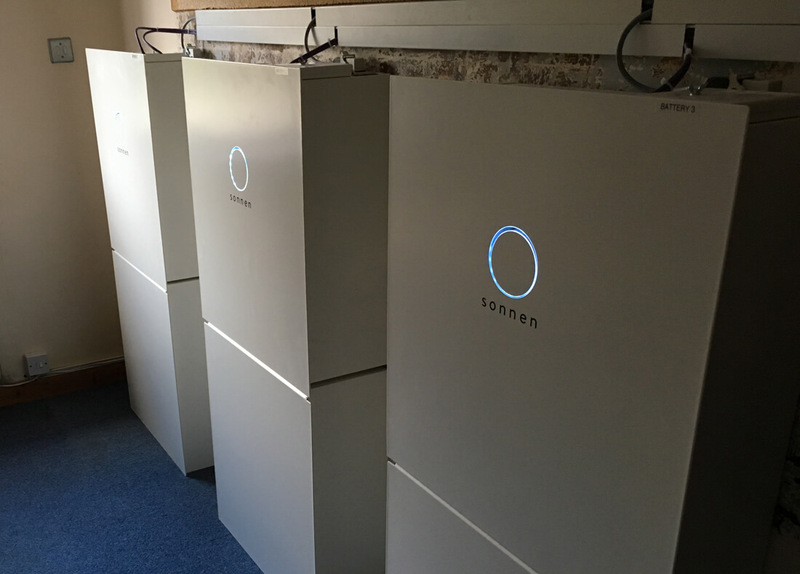 Joju Solar installed 3 x Sonnen Eco 8 4kWh batteries in just 2 days at the site. The system is meeting the school’s needs for electricity in the spring/summer/autumn months. However, it should be noted that in winter there will not be sufficient surplus electricity to charge up the batteries and the system will remain dormant at this time. However, do not despair! Our modelling shows that there are other ways of operating commercial battery storage systems in commercial premises that does give paybacks shorter than the battery lifetime, especially with the good economics of the Tesla Powerwall2 battery. If you’d like to see how this could work for you, then do get in touch with our batteries and smart grids team.